The Court Administrator Team consists of Krystal Horton, Deputy Court Administrator, Erica Deermer, IT Support and Procurement Specialist, Vickie Smith, Administrative Assistant and Ashley Boyd, UJS Assistant. 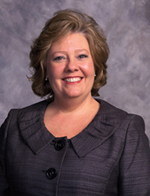 Kimberly Gray was appointed as Court Administrator by Presiding Judge Karen Hall in January 2013. Previously Kim worked in the Madison County Circuit Clerk’s office for 25 years. The Court Administrator serves as a conduit for many judicial operations of the courts and is responsible for the administration and management of the Jury System. The Court Administrator’s role is to facilitate the administrative responsibilities of the court and develop policies to enhance performance of the courts operations. Jury Management – oversee the county’s jury system to ensure efficient and cost effective policies and procedures are implemented. Fiscal Administration – prepare and guide court budgets; processing and management of grants. Case management reports and Statistics – collect data, analyze and evaluate pending caseloads, work with Clerk in data validation. Information Technology – provide support in all areas of Technology for the judicial staff and collaborate with the Administrative Office of Courts to promote the efficiency of our courts. Space Management – manage space to assure that Judges have adequate room to hold court to also instill public confidence in compliance with the American Disability Act.